I usually reserve Thursday mornings for getting outside for a walk or hike with Katie. But the weather has been so dreary and tomorrow’s forecast is for more dreariness so I decided to head out today. We headed to Acadia after dropping Amelia off at school. It was only 39 degrees and only scant wisps of fresh green are appearing here and there, but it was exciting to be out hiking. I felt a bit guilty for going without Artie who is working today, but I wasn’t guilty enough not to go. I picked Dorr Mountain as it’s easy to get to and a fairly easy but strenuous climb. 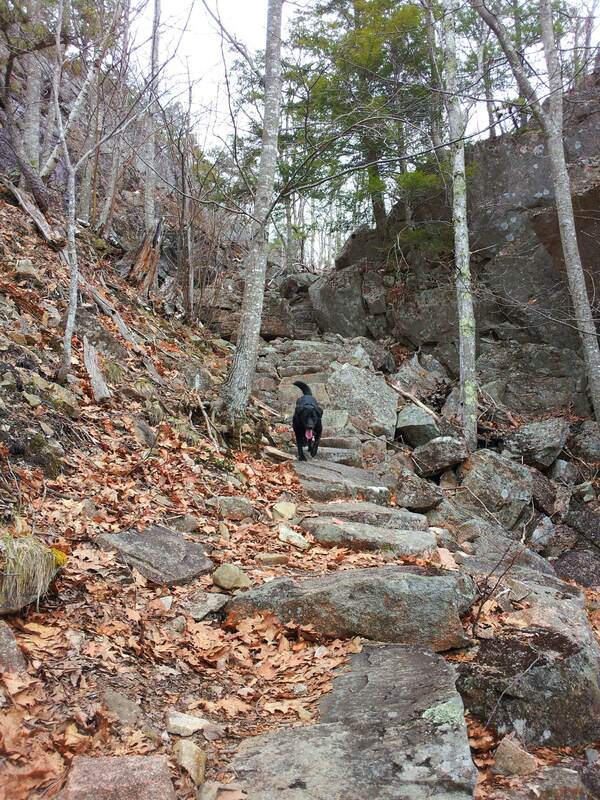 Strenuous because it’s steep, but easy because many of the trails up contain stone stairs…a lot of stairs. I parked at the Nature Center which reminded me that we need to take Amelia there…both to the gardens and then to walk the Jessup trail – more on that later. We walked past the closed Nature Center toward the little Abbe Museum (which I’ve never actually visited) and headed left toward the trail head. I’d love to tell you what trail we started on, but in the past few years Acadia NP has reverted many modern trail names to their more historical names, so even my relatively new map (and older trail guide) use irrelevant trail names. Makes for an extra special challenge when you’re trying to follow a particular route. I can tell you I was headed toward Kurt Diederich’s Climb which starts at the northern end of The Tarn. Kurt Diederich’s Climb consists mainly of stairs and it’s amazing to think of how these trails were made. According to my trusty guidebook, A Walk in the Park by Tom St. Germain, this trail was built in 1913 and the trails are as solid as can be. The trail switches back and forth, over steep terrain, occasionally heading parallel to the face which gave me a chance to catch my breath before heading up again. 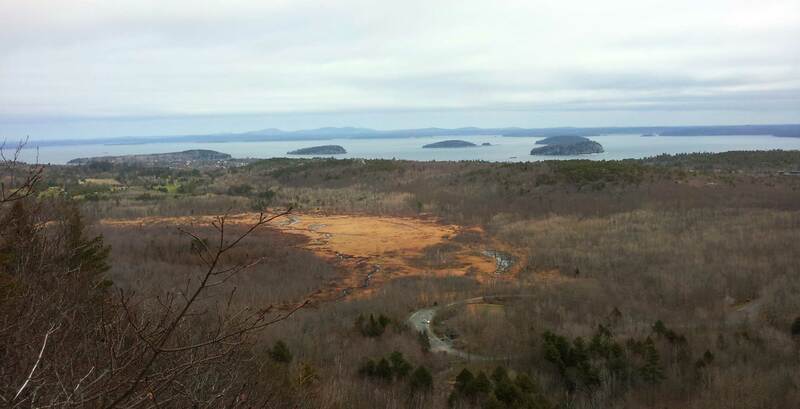 We had beautiful views of Bar Harbor, Frenchman’s Bay and The Tarn along this trail. Eventually we came to the intersection with the Ladder and Dorr Mtn. trails. We didn’t do the Ladder Trail today, but it’s a great alternative to the Precipice Trail which everyone wants to do but can’t between the months of April and August while the Peregrine falcons are nesting and the trail is closed. Artie and I last climbed it 7-8 years ago. It too has lots of stairs (more than 1200 according to the above mentioned guide) and three ladders. After all these years, I can’t remember details, but I do remember the nail-biting feeling of traversing those ladders. 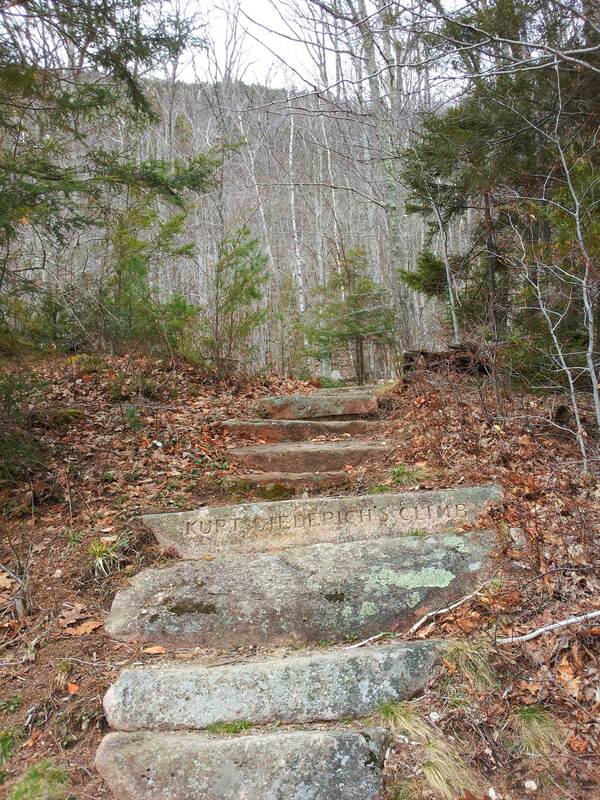 We took the Dorr Trail to the summit which included a few more stairs, walking through the woods where some parts of the trail were crossed with running water and lastly walking the near-bare top. Here we had views of the ocean to the west, as well as the eastern views of Frenchman’s Bay, etc. 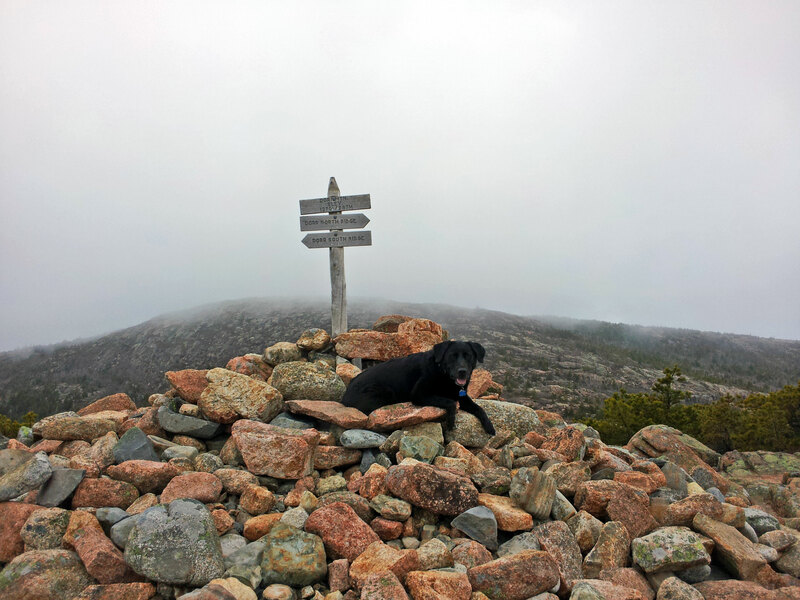 and Cadillac Mountain whose summit was lightly shrouded in cloud. Katie was very obliging. It probably didn’t hurt that I was holding a bag of jerky. We only stayed a couple minutes as it was cold and damp at the top (and all over, for that matter). 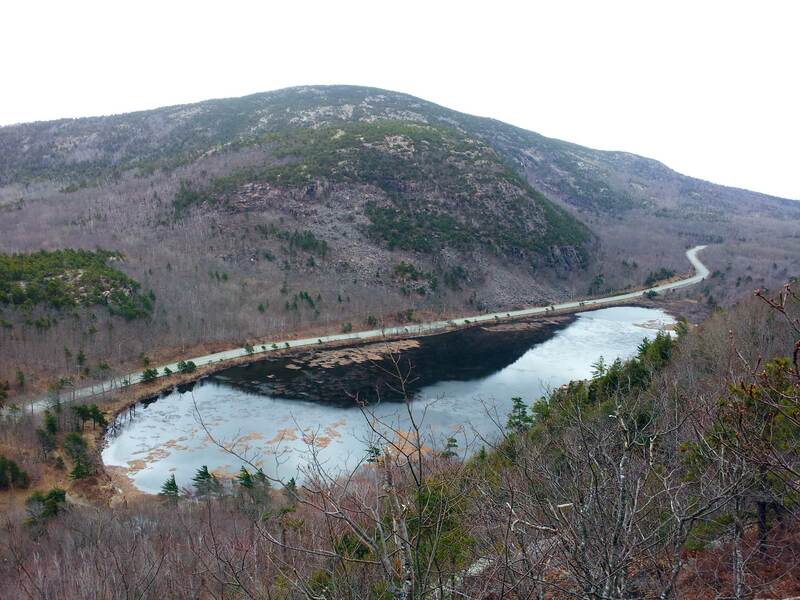 We headed back the same way we came – down the Dorr trail, but instead of going back down Kurt Diederich’s Climb we took Homans Path the rest of the way down. Homans Path (again, according to Tom St. Germain) was an abandoned trail (made in the early 1900’s) which he rediscovered in 1993. By 2003, the park had rehabilitated the trail and it’s now part of the trail system. I’m so glad it was found….it’s a spectacular trail with great views, interesting switchbacks and was really a joy to descend. It’s practically all stairs, so I was glad to be going down. 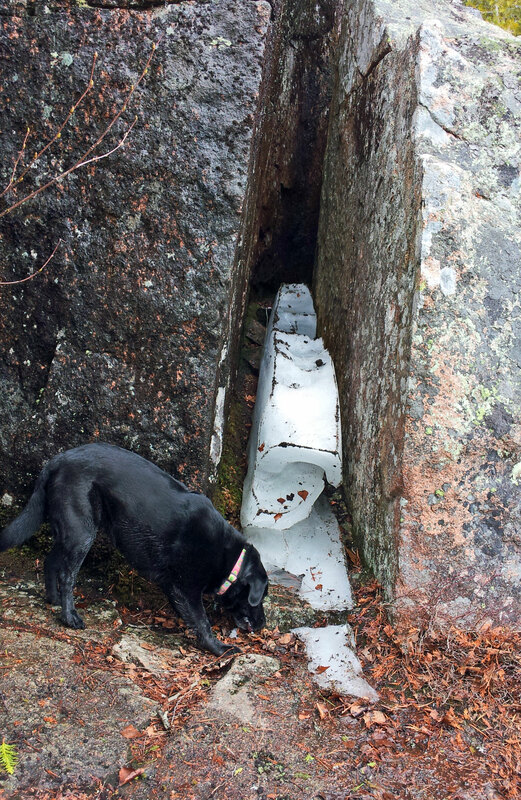 By the way, near the bottom, Katie and I found several protected areas that still had snow and ice. Katie took advantage and ate as much as she could. 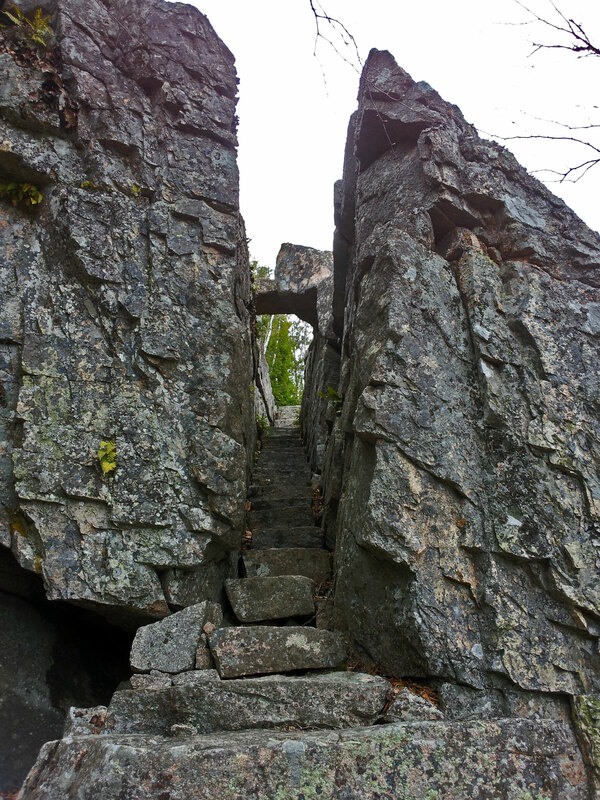 There were a couple areas where the trail ran through the rock like in the picture below. Unfortunately, I didn’t take many pictures coming down, so you’ll have to go check it out for yourself! It’s worth it. Coming down Holmans Path, I had a great view of the Great Meadow and the Jesup Path’s raised wood trail through the bog and Great Meadow, so I was excited to find that Holmans Path ended directly across from the start of the bog walk. After a quick check of the time, I walked the Jesup Path to where it connected to Hemlock Road and then circled back on the latter. Unfortunately, that little indulgence made me late in picking Amelia up from school (sorry Ms. Sasha!). Poor time management on my part. Back at the intersection of Jesup, Hemlock and Holmans, it was a quick .1 mi. walk back to the Nature Center parking lot where our hike finally ended. Both Katie and I were out of time and energy. According to my phone gps, we hiked 4.4 mi. I’m really looking forward to bringing Artie and Amelia back in a few weeks when everything starts turning green. I’ve been on Jesup Path in the spring and it’s vibrant, plus the Wild Acadia Gardens back at the Nature Center is a wonderful place to explore.